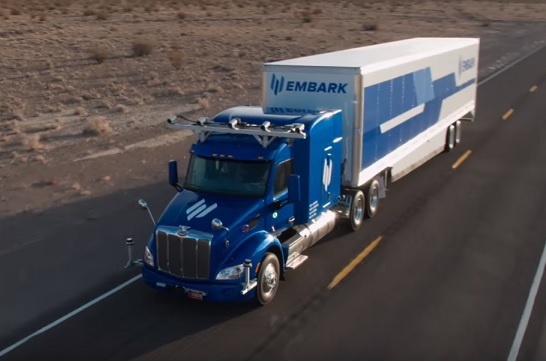 Embark, a self-driving trucking startup, has announced that it has secured an amount of $15 million in Series A funding round. Previously called Varden Labs, Embark has successfully received state approval for the testing of its semi-autonomous vehicles on public roads in Nevada. The round led by Data Collective, in participation with YC Continuity, Maven Ventures and SV Angel. The capital raised would be used for expanding the engineering team by employing new talent and to add more trucks. The startup also partnered with heavy equipment manufacturer Peterbilt. Embark trucks are equipped with its own neural net-based deep learning approach to autonomous trucking. The Embark team consists of robotics experts from some of the leading technology companies having specialization in artificial intelligence, machine learning, and real-world deployment of advanced technology.